Along the way to completion, Larry test-drove the shop by crafting projects. The on-the-job training was valuable. "Around Christmastime, I stopped arranging the shop long enough to build a doll's high chair for my granddaughter, Ali," he says. "From that project I learned that one tool might be too close to the wall. I'm glad she asked me to make that!" He also learned another valuable lesson: Take your time. "When you rush things," be notes, "you make mistakes." Larry also has begun to absorb some of the subtleties of enhancing a piece's appearance. To finish his workbench, tool stands and tables, he took a small blowtorch and applied it to the grain patterns in the wood, making them go darker. (See the bench on page 74.) It's won him considerable compliments. 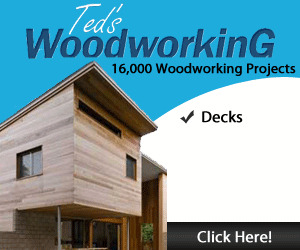 The shop experience hasn't been the smoothest ride for Larry, but he's sure learned to enjoy his woodworking retreat! He chuckles when he recalls the time he had breakfast; told his wife, Carma, he was going to the shop for a few hours; and was surprised when she popped in demanding to know when he was going to eat dinner. "I'd been in there for eight hours," he says, sheepishly. "It's all been worth it," he says. 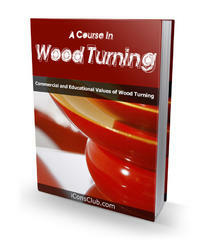 "Although my shop is small, it's very well suited to my woodworking ability—a beginner. I'll spend summers outdoors, but 1 can't wait till winter comes around again!" After his second winter in his new woodworking haven, Larry Schwager knows he's done the right things. 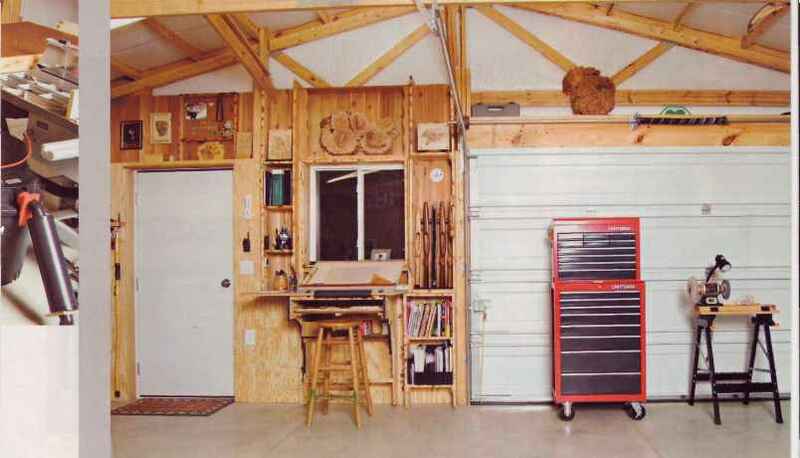 To store his wood, Larry bolted three 2x4s to his plywood wall, then cut particleboard shelves of various widths. The shelves rest on 1" dowels inserted into angled holes drilled into the 2x6s. Angling the dowels a few degrees helps settle boards against the 2x6s rather than possibly sliding forward. Larry also built a tablesaw outfeed table that fits on top of another store-bought solution—a table with adjustable legs. The shop-made top consists of two layers of MDF inset 1" into a 2x4 frame.